How can the UK affect global grain commodity markets when it only produces a fraction of their output? Ian Mitchell, former Deputy Chief Economist at the Department for Environment, Food & Rural Affairs, explains how his team applied the most innovative policy-making approaches from the UK Civil Service to lead a G20 initiative focused on improving the stability of global food markets. The challenge facing the UK was to design and deliver an agenda that would lead to material improvements in the stability of global food commodity markets. How could the UK unite and drive 28 countries and 10 international organisations to deliver the progress needed in just a year? The Department for Environment, Food & Rural Affairs (Defra) officials in charge looked to the best policy-making techniques in Whitehall for inspiration. In 2008, global agricultural prices spiked, with some grain prices doubling in the space of a few months. This increased prices for consumers across the world and, according to the World Bank, pushed tens of millions more people into hunger. By early 2014, these markets had returned to a state of relative calm. And experts sought to take advantage of the improved conditions to strengthen countries readiness to deal with such crises in the future. As part of that work, UK officials were chosen to chair a group set up by the G20 – the Agricultural Markets Information System (AMIS). The first step was to understand what changes could secure greater stability in these food markets. The team needed to identify and break down the most important elements of the global grain system, and the impacts on how it behaved. In short, they needed to establish ‘what works’. Economic analyses of the 2008 price spike by HMG* and others** identified several causes. These causes included weather-related production shocks, high energy prices and low grain stock levels; but panic-buying and restrictions on trade were also highlighted as key factors. Still, it was important to understand which of these underlying causes could be influenced. Following discussions with the FAO, leading academics, partner countries and former chairs, the team highlighted two major areas on which the UK’s agenda should focus. This included, firstly, persuading the world’s biggest grain producers to publish timely, robust data to send early, reliable market signals; and, secondly, preventing the confused and panicked response from countries that characterised the 2008 price spike. It was clear that these issues – although crucial – had not been the priority while contemporary market conditions dominated people’s attention. What works is based on the principle that good decision-making should be informed by the best available evidence. If evidence is not available, decision-makers should use high-quality methods to find out what works. As well as setting the UK’s agenda, UK officials incorporated the ‘what works’ approach into the planning and processes of AMIS. This included collating immediate online feedback from delegates following international meetings to check the project was heading in the right direction. More broadly, it meant introducing an evaluation framework and performance indicators to measure the impact of AMIS’s work on a more consistent and regular basis. The team used the Magenta book guidance on designing evaluation to establish a logic model that linked inputs and activities to impacts and outcomes. These evaluation mechanisms were agreed at the Senior Officials group. Signals from data on global grain ultimately drive the decisions of millions of farmers, and stock-level data, in particular, was a key issue in the 2008 price spike. 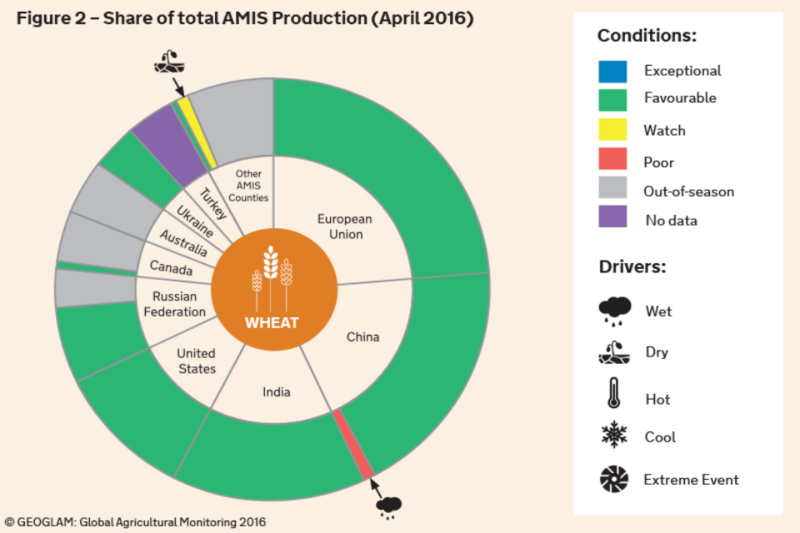 Traditional methods of measurement still have an important part to play, and the estimates of major producers, like China (see Figure 2 – wheat growing conditions) can have a material impact on global markets. Indeed, the issue of stock measurement was so significant that the UK hosted an international workshop to bring together Defra statisticians and other international experts to share best practice on how to survey grain stocks and make this data more widely available. This session, along with a carefully planned ministerial visit to Beijing, played a crucial part in China agreeing to host a further ground-breaking workshop last summer. Commitments were agreed to fundamentally improve the quality of global stocks data and will, in turn, enhance wider market stability. The UK team also drew on the power of open data to improve the quality and scope of market information available to help countries make more informed decisions, and develop new tools and technologies to boost their insights. For example, AMIS uses satellite data to help characterise global growing conditions (see Figure 2), and this information has become publicly available, as well as a regular part of ministers’ briefing in the UK and elsewhere. The final strand of the UK’s agenda for AMIS was to strengthen countries’ collective responses to abnormal market conditions, with the aim of avoiding knee-jerk reactions when the next crisis hits. Drawing on Defra officials’ experience of responding to disease outbreaks, the UK developed and proposed a ‘protocol’ to help shape countries’ potential responses – by clarifying the essential roles and responsibilities more clearly. Despite their expertise, the team knew just what a challenge it would be to get the 28 different countries to agree a single protocol. But the officials took their inspiration from the Department for Education’s five policy tests (see the box below). As a result, they asked themselves: “Are you confident that you are providing world-leading policy advice based on the very latest expert thinking?” To test their answer, they organised a workshop with the world’s leading agricultural economists. There, the academics were able to provide cutting-edge expertise on reform to the senior policy makers from agriculture ministries around the globe. This experience and shared knowledge then helped to build collective purpose among country members and achieve agreement of the protocol. The team also saw how others were using open policy-making to ensure that wider stakeholders and commentators have access to full analysis and advice on market conditions. Last autumn, for the first time ever, the FAO webcast the first half of the international meeting on crop prospects live from the Milan Expo. The media were also in attendance, and Twitter was used to enable real-time interactions with interested viewers. Open policy making is better policy-making through broadening the range of people we engage with, using the latest analytical techniques, and taking an agile, iterative approach to implementation. The Department for Education’s five policy tests were developed to help create a shared perception of world-class policy and how to deliver it. The UK’s AMIS agenda has already been recognised as ambitious. Senior figures in the UN and other countries have praised it for generating bold new ideas. Together, the team hope it has raised the bar for future chairs (the US is the current chair and Germany will take over in June). For the Defra officials involved, this experience of chairing an international group was extremely positive – not just in terms of making a tangible international contribution, but also by boosting departmental learning and opportunities. It was a challenge. There were frustrations – not every country or institution shares our philosophy, for example, in terms of measuring the impact of our efforts. But if you get the chance to work in an international forum like this, make sure you take it. What impact will this actually have? 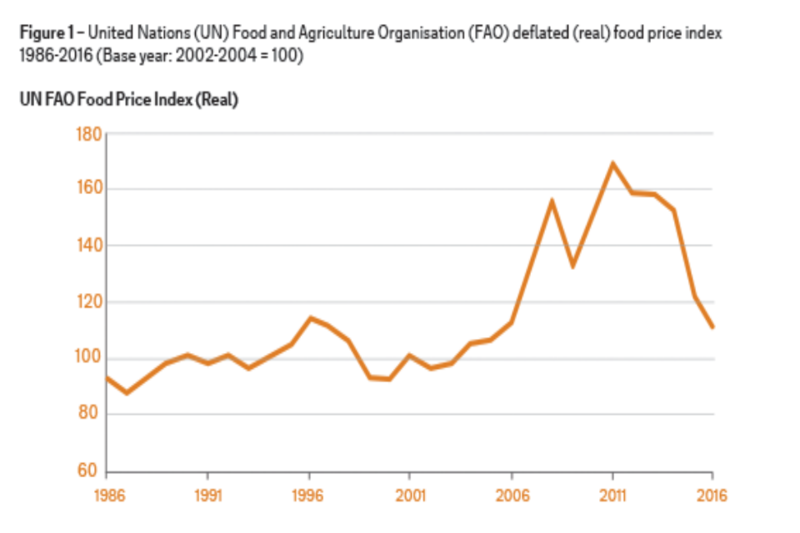 Global food commodity prices are now largely on a downward trend. But analysis by the Organisation for Economic Cooperation and Development (OECD) and FAO suggests we should expect a period of ‘greater volatility’ in agricultural commodities every ten years or so. In the 2008 price spike, tens of millions were pushed into hunger. If the UK’s efforts have reduced that probability or impact even incrementally, it could make a critical difference to consumer prices, stability and hunger.